Five Cleethorpes AC athletes represent Humberside at Regional Combined Events Championships in Middlesbrough. 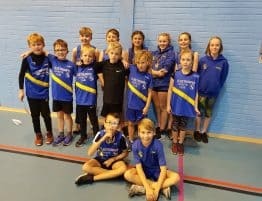 Middlesbrough hosted the 2016 Regional Combeind Events Championships with athletes from the North East region fighting it out for a place at the National Championships which are to be held in September at Exeter. 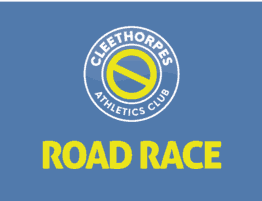 Cleethorpes AC had five Humberside representatives at the event which is held over two days. 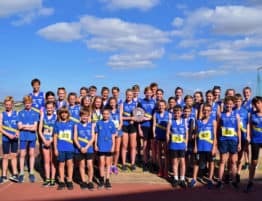 Nathan Smith competed in the Junior Boys (U15) and Katie Brentnall competed in the Senior Women (U19) on Saturday. Ellie Jones, Gabrielle Walker and Robyn Greenway competed in the Junior Girls (U15) on Sunday along with Katie who completed her Heptathlon. Unfortunately, Megan Winchester (Inter Girls – U17) and William Seed (Senior Boys – U19) had to withdraw from the event due to injury. Will had represented Humberside in the last three National Combined Events Finals, finishing 6th last year and had already finished 7th at this year England Athletics U20 Championships. Nathan was competing in his first Regional Combined Events Finals and did well as part of the Humberside team which finished 2nd to Durham. Nathan finished 10th overall at the bottom end of the age group. 80m Hurdles – 17.7s; Shot – 6.58m; Long Jump – 4.25m; High Jump – 1.34m; 800m – 3:13.2; Points – 1015 (PB). Ellie was also competing in her first Pentathlon and did extremely well to equal the club record held by Jade Woolsey (Points – 2286). Ellie finished 11th overall at the top end of the age group. 75m Hurdles – 13.5s; Shot – 7.33m; High Jump – 1.39m (PB); Long Jump – 4.14m (PB); 800m – 2:40.5 (PB); Points – 2286 (PB). Gabrielle was another competing in her first Pentathlon at the bottom end of the age group. She started well but had to pull out during the Long Jump due to an injury but managed to complete the 800m, finishing 16th overall. 75m Hurdles – 12.9 (PB); Shot – 6.77m; High Jump – 1.24m; Long Jump – 4.23m; 800m – 2:59.0; Points – 1985 (PB). Another first timer in the Pentathlon was Robyn Greenway, also at the bottom end of the age group. Robyn finished 17th. 75m Hurdles – 16.5s (PB); Shot – 6.11m; High Jump – 1.39m; Long Jump – 3.94m (PB); 800m – 2:40.3; Points – 1937 (PB). Competing over two days, Katie had seven event to compete in. She did excellently to finish 6th and to break the club record previously held by Jade Woolsey – Points: 3271. 100m Hurdles – 17.1s; High Jump – 1.41m (PB); Shot – 7.23m (PB); 200m – 28.4s (PB); Long Jump – 4.57m; Javelin – 15.82m (PB); 800m – 2:37.7; Points 3271 (PB). At this time it is unclear on whether anyone has made the National Finals in September to be held at Exeter.